JAMES M. KOCIS is the founder and President of the Burgiss Group, one of the leading software and financial service providers to the private equity industry. He and his team designed Private i, the world's most popular program for private equity portfolio management. Private i is used to manage in excess of $1 trillion of private equity investments. JAMES C. BACHMAN IV, CAIA, is the Head of Research at the Burgiss Group. In this role, he is principally responsible for research-related initiatives as well as expanding the technology platform's portfolio management capabilities. AUSTIN M. LONG III, JD, CPA, is the Head of Alignment Capital, a private equity consultancy. He has been active in the private markets since 1987, when he cofounded what was to become the University of Texas Investment Management Company (UTIMCO) private investment group. CRAIG J. NICKELS, CFA, is the Director of Private Markets for Washington University in St. Louis, where his responsibilities include the oversight and management of the university's private market investments within the multi-billion endowment. CHAPTER 2: Private Equity Perspectives. CHAPTER 3: Managing the Investment Process. CHAPTER 4: Capturing a Portfolio. CHAPTER 5: Tracking Portfolio Holdings. PART TWO: Measurements and Comparisons. CHAPTER 9: Flawed Research Methodologies. CHAPTER 10: Visualizing Private Equity Performance. CHAPTER 11: The IRR and the Public Markets. PART THREE: Topics on Risk. CHAPTER 13: The Concentration of Wealth. CHAPTER 14: The Diversification of Portfolios. CHAPTER 15: Cash Management Models. 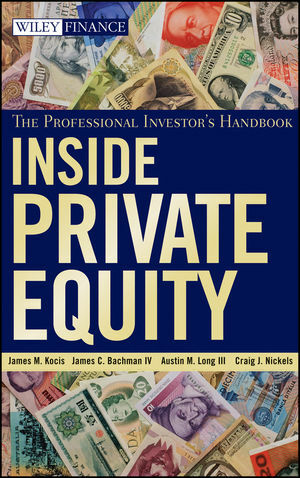 CHAPTER 16: The Private Equity Professional. APPENDIX A: Proposed Venture Capital Portfolio Valuation Guidelines. APPENDIX B: On-Site GP Audit Program Guide. APPENDIX C: Qualitative Due Diligence: Structured Interview. APPENDIX D: Qualitative Due Diligence: Structured Reference Calls. APPENDIX E: Request for Information (RFI). APPENDIX F: Advanced Topics: Duration of Performance. APPENDIX G: Advanced Topics: Correlation and Opportunity Costs.